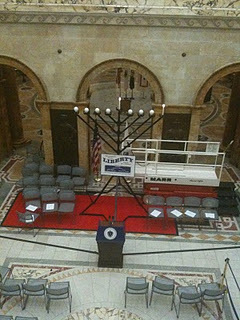 The State House will be the setting this afternoon for the annual Menorah lighting at the Grand Staircase. The lighting of the Menorah is in recognition of Hanukkah, which commenced on Sunday, December 2nd. Today’s lighting is open to the public and will take place on the 2nd floor of the State House, and begins approximately at 4:00pm.